rec = rec & varData(intFields, intRecords) & ","
The records are not arranged in row order as they appear in datasheet view, instead they are loaded in columns. So, after loading the data in memory we must know how to address the two dimensional array to access each record in correct order to output the data. Each field value is separated with a comma in the listing provided in the Debug window. Normally, in a two dimensional Array the first index value of the array is the row number and the second one is column number. But, in this case the first index value is the Field order Number and the second value is the Record Number. You can check the sample data arrangement in memory shown above. 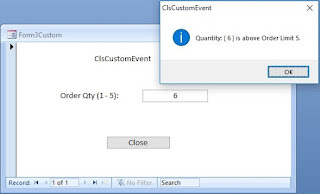 We will write a small utility program to export any MS-Access Table into comma delimited Text/CSV File, so that the data can be easily transported through internet or to import into other Applications. rec = rec & Chr$(34) & rst.Fields(intFields).Name & Chr$(34) & ","
rec = rec & IIf(fld_type = 10, Chr$(34) & varTable(intFields, intRecords) & Chr$(34), varTable(intFields, intRecords)) & ","
NB: If MEMO or Photo Fields are present in the Table they are excluded from the output file. The target file extension can be either .TXT or .CSV.